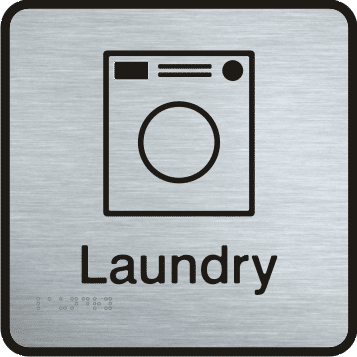 Our stainless steel signs are made using marine grade #4 linished stainless steel with stainless steel braille and feature a 5mm contrasting *border to ensure luminance contrast with the wall surface. These are suited to both indoor and outdoor applications. *As an option the 5mm border can be omitted. Please Note: We are experts in custom signage! If the sign you require is not listed below we are happy to manufacture a custom sign to your specific requirements. We also manufacture in acrylic, anodised aluminium and two pack finished materials. A unisex sign is for a single facility intended for use by both males and females. Unisex accessible sanitary facility signs must include the male, female and access symbols. Unisex accessible toilet signs must include the tactile characters LH or RH to indicate a left hand or right hand transfer to the WC pan. Click Here for info to help determine LH or RH. These signs are used to indicate multiple seperate facilities. If the facility is a single room intended for use by both males and females, then a unisex sign (see above) should be used. The building code requires that each door required by E4.5 to be provided with an exit sign stating “Exit” and “Level” followed by the floor level number. All below signs are available for other level numbers.